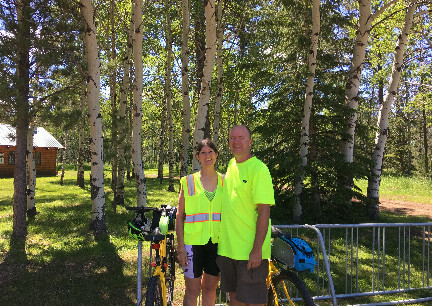 Deron and I have ridden the Mickelson Trail, There and Back, Plus spent many other miles riding our bicycles, snowshoeing and CC Skiing it. Deron surprised me with this book (in the photo). We are looking at some of the trails and thinking of planning trips around them. What a GREAT way to see the USA and Burn Calories! 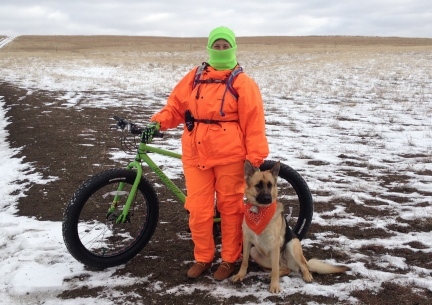 Scroll Down To Seep Photos of and Read About Our Fat Bike Adventures On The Mickelson in SNOW! 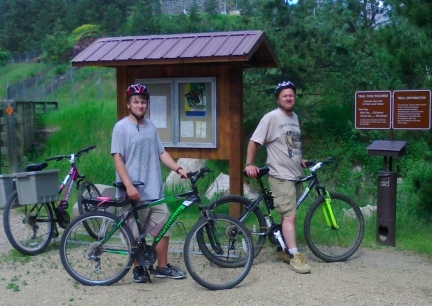 PHOTO OF DERON AND I TAKEN JUST AFTER WE COMPLETED RIDING THE MICKELSON TRAIL, EVERY BIT OF IT, BOTH DIRECTIONS..... No. Not in one Day. Deron and I have ridden the Mickelson Trails, every section, both directions at least a few times. 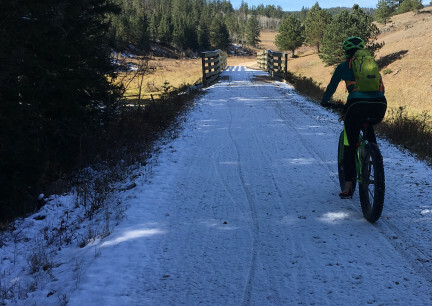 We not only ride our bicycles (even in the snow) on the Trail we also CC Ski and Snowshoe in the Deadwood area. I am compiling a Blog about the Mickelson (below) and am writing a Book. 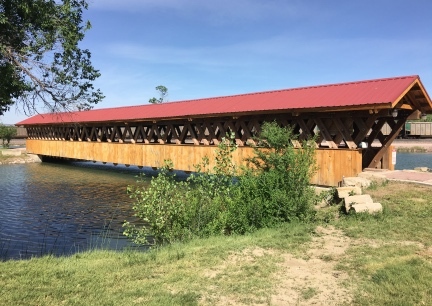 Our goal is to share with others about this, South Dakota's, State Treasure, open to all, and we hope YOU too will get out and enjoy the Mickelson and or Rails To Trail Systems near you! Deron and I loved riding the Katy Trail when we lived in Missouri. LOVED it! 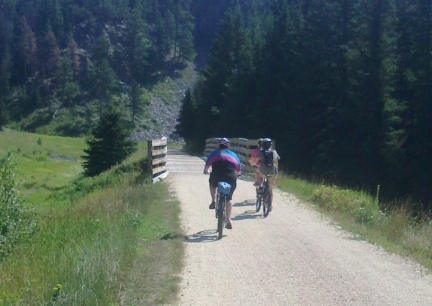 We not only rode the Katy on our bicycles, but also drove behind Sled Dogs, both on snow and using our "rigs" on wheels. We hiked and backpacked on the Katy with our dogs also. So when we started (seriously) riding bicycles here in SD, we were anxious to give the Mickelson Trail a "go". Riding on a Rails To Trails Trail is a GREAT way to see a lot of a State (there are many Rails To Trails throughout the USA) from a safe area (bicycle and trail), slowly without worrying (unless crossing the road or riding to the Trail) and be able to get out into Fresh Air, Sunshine, and get Exercise, all without even thinking about it...you will be thinking about the Trail and what you are seeing and enjoying it! And the COST for all of this is so MINIMAL! There are websites that have lists of the different Rails To Trails throughout the USA. Do an Internet Search to find a Trail near you or in the area you might be vacationing in. Deron and I, as of June 2016, have not ridden the Mickelson "End to End", that is all in one several day ride. But we have, as of June 2016, ridden almost each and every section, out AND back. I have ridden Katy Trail not only in sections, many, many times, but I also rode my bicycle in a group 'End to End' in 5 days. 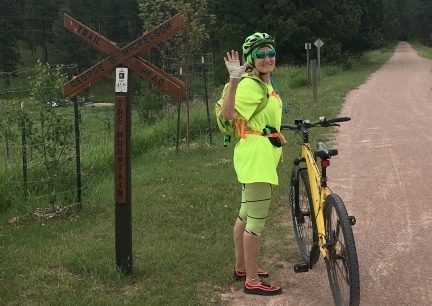 Although I have a Bicycle Blog here on this site with Mickelson Trail blogs on it, I also hope to keep filling this page out with not only our own stories and photos, but also information that might help YOU as you ride The Mickelson. So. Here I start a new page....scroll around to find information you are looking for, such as, Weather Information, What A Person Might Wear and Carry with them, Trail Rules and Trail Etiquette and more. 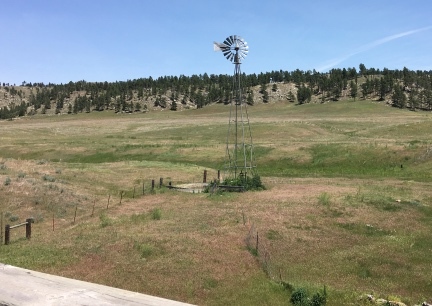 Stay and read about our rides on the Mickelson Trail. 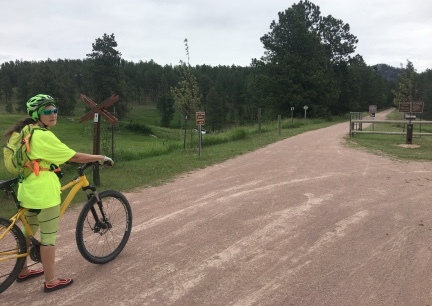 Most folks riding the Mickelson Trail, especially End to End, are "in love" with their Bicycles. What does that mean? 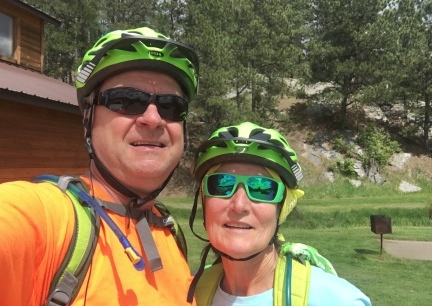 They love being out riding their Bicycles, they love the feel of Freedom, they love to get their exercise riding their Bicycle. Also. 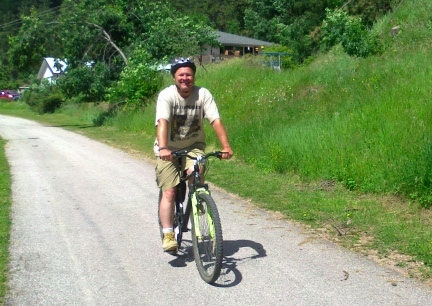 If you are trying to lose weight, get in shape, get healthier, riding a bicycle is the most fun way you could do this. Drs. are telling people with "weak" or "injured" knees, bicycles are a good way to build those muscles around and within the knee to become stronger... Of course. <rolls eyes that people have to be told> Check with your own Dr if you have health problems. These are easy to get your hands on and they are FREE! They are light weight and can be carried along with you while on the Trail or while planning your trips/trip. 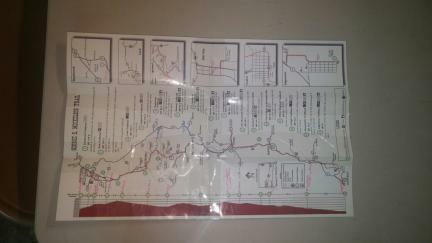 These maps, printed on tough, thick, paper, can be found in each of the Trail Pass Boxes on the Trail at the Trailheads. Or, you can also pick them up at several of the Businesses and Chamber of Commerce in the Towns on the Trail. If you look at this photo you can see that the Map has the incline of the hills as well as information on how to get to the Trail Heads, Highway Map, Distance between the Trail Heads and other printed information on the other side such as several sections about the Trail and Telephone Numbers and more. As you can see, my Map is worn and torn and taped and written on. Well used. 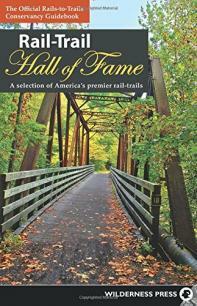 It seems each of the Rails To Trails have a book written about them....and I love that fact. I bought the one on The Katy Trail when I started using it, and I READ that book. I read it more than once, I read about the sections I was going to be visiting, more than one and I made my own notes in that book. 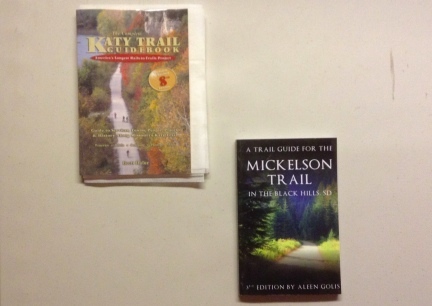 I have done the same with my copy of "A Trail Guide For The Mickelson Trail In The Black Hills, SD" too. 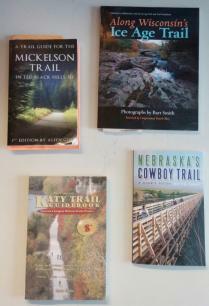 Not only do these books tell you about the Trail, they tell you about the area, what to expect, a bit of History, about the RRs. You might read about something out there worth seeing you would have missed had you not read about it in the book before your visit. The Rrails to Trails Books are worth buying and they are worth reading. With the Telephone Numbers included within, worth carrying if you are Using the Trail End To End and have the room for the book to ride along. You could use a Ping Pong Paddle to play Tennis or Badmitten, but is it a good idea? Would you do well at it? Would you have fun? Bicycle Fit is a real thing. Bicycles need to be in Good Condition, that is, Tuned, Tires Filled, Lubed. AND THESE THINGS MATTER! When riding a Rails To Trails Trail you are out "there" without support. On Rails To Trails Trails you can have more than 40 miles between Trailheads and there is NOTHING out there. Sometimes, not even shade. 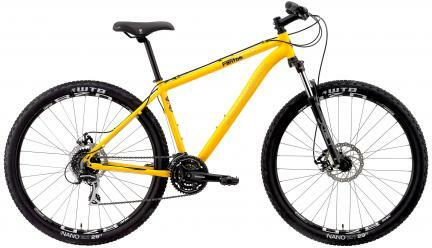 If you are riding an ill fitting bicycle, it will be like a Hiker wearing ill fitting boots. If you do not know about Bicycle Fit, visit a Bicycle Shop and ask a Sales Person to show you. If you are not the mechanical type, take your bicycle in for a "Tune Up" before you hit the trail. While there buy a Spare Tube for it. And IF you do not have basic Bicycle Tools, buy those too. Expensive? You will not think so if you need them on the trail....they can be "worth their weight in gold". And don't expect others riding the trail to bail you out either. Road Bicycles...the ones with skinny tires....were NOT made for Rails To Trail Systems. Bicycles with Mountain Bicycle Tires were. 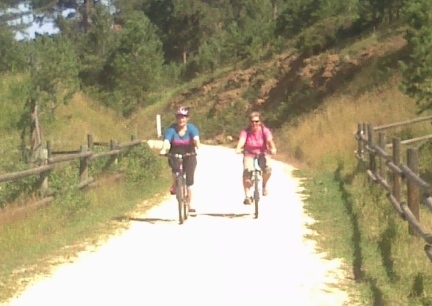 I am not saying that the Trail could not be ridden with a Road or Fatty, I am saying that the BEST choice would be Mt. Bikes. And yes. There are places along the trail that Rent Them. IF you ride a Road Bike, be sure to take a couple of extra tire tubes and tools. Be ready for "the shake up", it will be a rough ride. IF YOU SET OUT ON THE RAILS TO TRAILS BE PREPARED! IT WILL BE A LONG, HARD, IN THE SUMMER TIME, HOT, WALK BACK TO THE NEAREST TOWN, PUSHING YOUR BROKEN BICYCLE ALL THE WAY. That said: Deron and I met a very fit man that had JUST finished riding the Mickelson Trail on a discount store Huffy Brand Bicycle. And. When I rode the Katy Trail, End To End, a young man was in the Group that was on a discount Bicycle, far to small for him, that had been stored outdoors for years, and it showed. 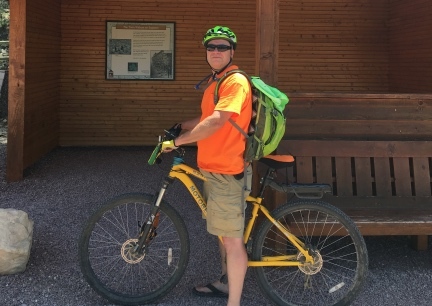 He rode mile after mile after mile, completing the long trail. Deron and I have seen all types of Bicycles from all the Brands and Makes out on the Trail. MY POINT, IF THAT IS WHAT YOU HAVE, GO! RIDE! ENJOY! You do not have to be a "wrench", as they call Bicycle Shop Repair people. But you should know how to change a tire, carry at least a small set of tools, as well as a tube that fits your bicycle and someone in your group should have a tire pump. 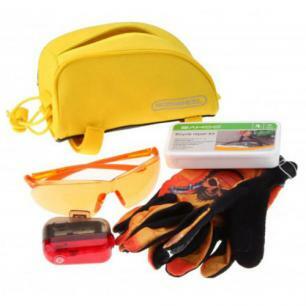 Tools you might want to carry in a small bag on your bicycle that are easy to get to and out of the way. Most trips you WON'T need them. It does not take a Rocket Scientist to know that most of the parts on the bicycle can be fixed with Tools from the Hardware Store and you probably do not even need "high end" tools. But there are some Bicycle Tools that you will want to own. Tubes for the type of bicycles ridden (each person should have the type they need, but if in a large group, many times only one or two people carry a tube if bicycle require the same type. Bicycle Tire Tube Levers. These are so handy...and if you ever "fought" a tire Change you know how important these inexpensive tools are. 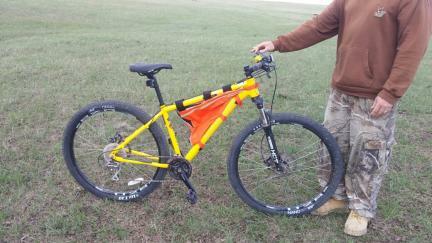 while this photo is not of our bicycle, it is the same type bag Deron carries our Bicycle Tools in. This list should be Tailored for YOUR own use. 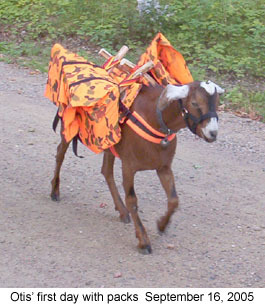 But there are some basic items that anyone on Trails should have with them. Seriously. Take water with you when you ride this trail. WINTER ~ SPRING ~ SUMMER ~ FALL You will NEED to carry water with you when riding or walking The Mickelson, or any, Rails to Trails Trail System. 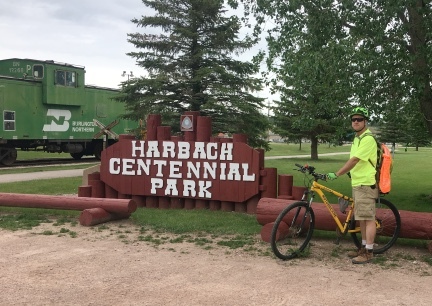 For a Rails To Trails Bicycle Ride, some Trailheads can be over 40 miles with NOTHING in between them, be sure to have 2 - 3 water bottles per person. You might not drink them, but way better to have water and not need it, than to get into trouble out there on the trail alone...even if alone is with your friends and/or family. KEEP IN MIND: You might even need Water out on the Trail for First Aid Purposes. You need to decide HOW you will carry your water and a lot of water on your bicycle. There are several ways to do this. 1. 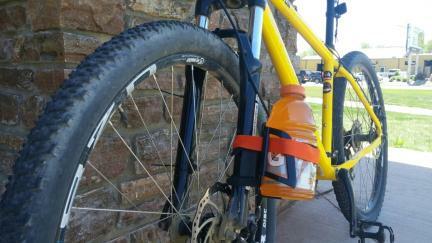 You can attach a "water bottle cage" to the frame of your bicycle. However, for the average rider on the Rails to Trails Systems, you might fumble and you might fall trying to drink while riding. But if you only drink when you stop for a break and you break often, this will work well. However. ~Water bottles will be exposed to the sun...and you know what this means. 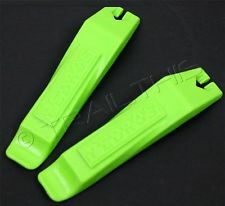 ~BUY A GOOD WATER BOTTLE CAGE, cheap ones will drop your bottle and or break. Metal are usually best. 2. Camelbaks. This photo is of Deron's Camelbak. We own several and LOVE them. We carry the M.U.L.E. when riding our bicycles. 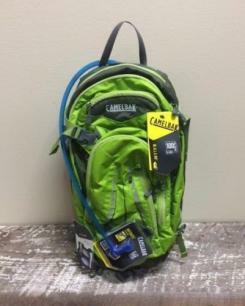 We can carry jackets and extra gloves as well as other necessary items in the Camelbak AND have water that is so EASY to get to while riding. My Camelbacks are set up for my Holster also. 3. Water Bottles/Jars in a Backpack or Bicycle Bag or even inside a Bicycle Trailer you might be pulling. 4. Frozen Ice in Bottles to thaw as you ride....Carry on your person, in a backpack, if hot...these will cool you down and melt more to drink. 5. Backpack with Water Bottles. 6. 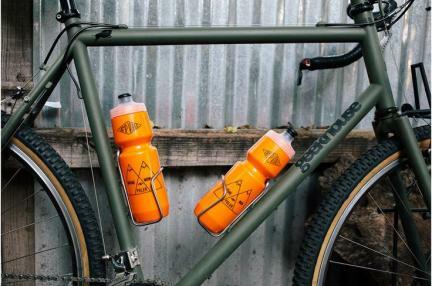 There are different types of Water or Bottle Cages to add to Bicycle Frames. Some frames are set up for Bottle Cages on the Fork...some are not. But there are also Water Bottle Cages that have rubber backings and attach even without holes. 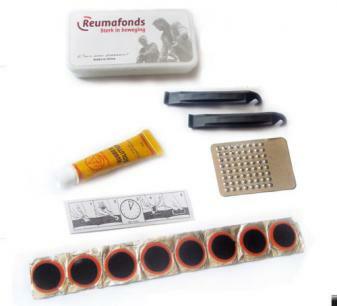 Keep your frame and the rubber clean, and these will stay in place even on long rough rides. The list can go on and on....but you get the idea...CARRY WATER ANY TIME OF YEAR. What Bicycle Bags you choose to use on a particular day depends on several things...Season Of Year, How Long Your Ride Will Be, How Many People In Your Riding Party, What Your Bicycle Is Set Up To Hold, and a few other factors. I will be adding ideas and photos of how you might carry items, from just a few bags for a few hours ride, to panniers for an End To End Several Day Ride. I DO HAVE PATTERNS, IDEAS, INFORMATION AND PHOTOS OF HOW TO MAKE YOUR OWN PANNIERS AND OTHER BAGS, just check out the menu and see our Bicycle Blog Page. 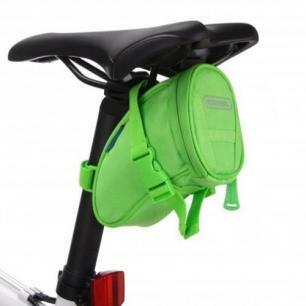 It is amazing how many items you can put into a "Gas Tank" type Bicycle Bag like this one. Deron and I have these and use them. In the Summer I carry Bug Spray, Hand Sanitizer, Sun Screen and more inside of the one like this photo, that I carry. I also like our Bicycle Bags to be BRIGHTLY Colored. Anything a rider can do to catch the eye of a vehicle driver on the same roadway. If you are not carrying a lot of items on the trail, small bags are better than larger bags. 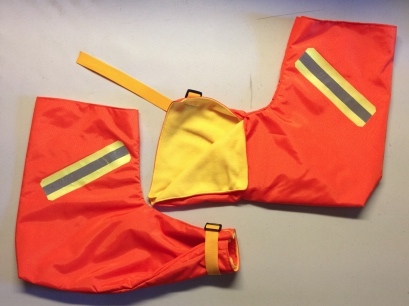 Larger Bicycle Bags will create "drag" and also could be a problem for wind. SD is WINDY! 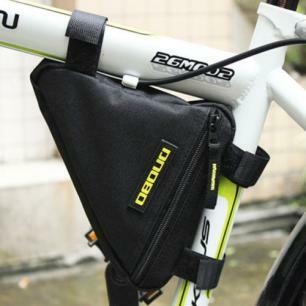 There are many types of small and large Bicycle Bags that can be used. Find the one(s) that work for you. Don't carry too much extra weight, but take everything your need to make your ride enjoyable. Yes. All these photos of Bicycle Bags, are Bicycle Bags that Deron and I own and use on our bicycles, depending on where we ride and what we are carrying with us. You MUST dress correctly for the trail or you are going to be misreable for MILES! If you head out in the Winter, dress for Winter. But you also need to remember to dress in layers. You do not want to get hot and sweaty under your coat while riding on your bicycle. As far as Safety. Think about this. When you are driving in your own vehicle and come across people riding bicycles, who do you see first? The guy in the gray/black clothing or the people in the bright colored shirts/vests? Who do you think is safer? A few of the Trail Heads require you to ride your bicycle through town. And, keep in mind, that, the Mickelson, in many areas, crosses roadways and driveways along the Trail. Be Seen. Wear Clothes Drivers Can Spot Easily! Helmets. Why would you NOT wear a Helmet? Today's Helmets are comfortable and give you not only protection if you fall, but a visor to keep the sun out of your eyes/face. IF you wear long pants. If you add a layer and one of the layers is Rain Pants or Winter Over Pants....have an Elastic or Velcroed Band to keep that bicycle chain side out of the chain and crank of the bicycle. I HIGHLY recommend Padded Bicycle Pants/Shorts. Dress in Layers and Yes, carry that jacket/rain coat even on hot days. You never know. And if you are miles out... 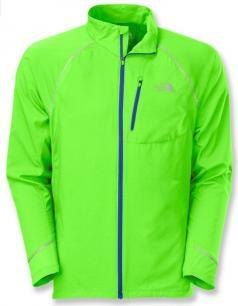 There is a jacket on the Market called "skin", they are very light weight and well made. They can be just the "ticket" for starting out on a cool morning or coming in on a day the sun is setting and it is cooling....or if the rain starts unexpectedly. Weather will of course decide how you will dress. 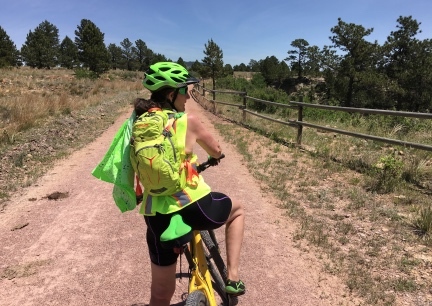 If it is Summer time you might want to carry a light weight, cotton blend, long sleeved shirt to cover your arms in the areas of the trail that the sun beats down on you for miles. 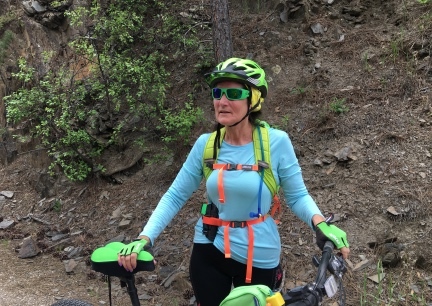 If you do not want sweat in your eyes as you ride on Hotter days, a Sweat Band will be a wonderful little thing to have with you on the Trail. Neck Coolers. Seriously. These are MARVELOUS Wonders! They hold the water cool around your Juggler Veins and that will help keep your temps down within your body. Full and Half Finger Padded Bicycle Gloves. Why both? 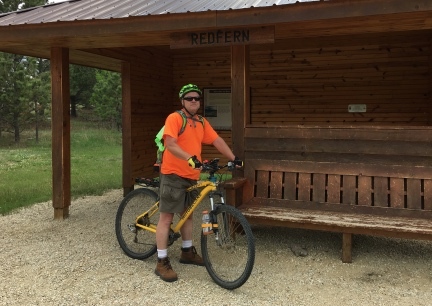 June 2016 Deron and I were riding the Trail from Hill City to The Mountain. As we rode it got colder and colder. Our hands were in Half Finger Gloves...and about froze when we got back to the Trail Head. I won't not have both with me on any ride again. Fleece Head Band... I also pulled this out and wore it on that June 2016 ride. So glad I carry those. I learned not to be without these back when I was a Sled Dog Racer. Carry/Have/Wear a Bandanna. I learned many many moons ago not to be without a Bandanna, especially when Hiking or Cycling or Backpacking or out with Dogs. If you take the time to read, also on this site, 101 Uses For A Bandanna, you can see why. Ladies ~ Correct Fitting Sports Bra. In the hot weather I ride with just my Sports Bra under a Mesh Hot Colored Vest. I stay cool, and supported for the "washboard" of the trail. Shoes. Now here is a whole section I could write. I will tell you that your shoes need to be flat and the sole needs to be hard. IF you wear running shoes, while riding a bicycle, you have to squish the shoe first, with each push of the pedal, before you push the pedal. You will be working harder in "tennis" or "gym" type shoes than in shoes that have a flat and or hard sole. Some items are so worth carrying along with you. Neck Coolers and Pogies are those items. Neck Coolers, those thin bandanna looking "necklaces" that tie on around your neck, after you soak them in cold water and they swell up, are one of those Summer Items worth having along. Yes. A Bandana could be used, but why not have something that not only stays wet, it stays cool around your big veins in your neck? Pogies. Pogies, pronounced POE-gees. Mittens attached to your handlebars. The ones I like are the ones that adjust so that you can open them a bit if your hands get hot, or can be snugged down so that no wind gets in. You should wear your bicycle gloves under these. If it were not for Pogies and other Winter Gear, I would not have been able to keep riding my bicycle in the Winter....and keep up the endurance and weight loss. Yes. 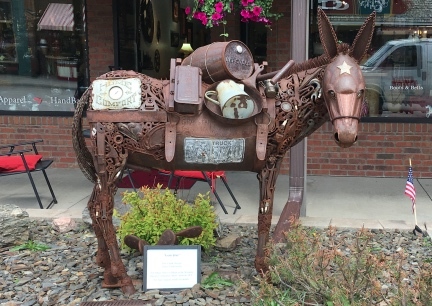 You sure can ride a Horse, Mule, Donkey, Hinnie on the Mickelson Trail. I would HIGHLY Recommend you desensitize your equine to Bicycle, fast and slow, Hikers, Runners, and such. Yes. You DO have the right away on the Trail....but not every body knows that. Nor does the average person know about Equine. They will not know how to act around them. IF you do not know Trail Etiquette, LEARN IT! Trail Etiquette is not just for Rails To Trails, IT IS FOR ALL TRAILS AND SIDEWALKS! FIRST AND MOST IMPORTANT!! THERE IS NO PLACE CALLED "IN THE WOODS". ALL WOODS, ALL LAND, IS OWNED BY SOMEONE. MAKE SURE YOU HAVE PERMISSION TO BE ON THAT LAND. IF IT IS A PARK, YOU WILL STILL NEED TO MAKE SURE THAT YOU STAY WHERE YOU (and your bicycle) ARE ALLOWED! Sharing the trail with others. <deep sigh> Here is where people can get into big fights out on the trail. Most people are kind and considerate and most people will heed even if they have the right of way. Horses, Mules, Donkeys, ie ALL Equine always have the right away. You must get off the trail and stop moving for them. Far off if that is what it takes. It does not matter if they came up behind you and are passing or if they came from the opposite direction. Remember that many horses may have never seen a bicycle, and the horse may spook. 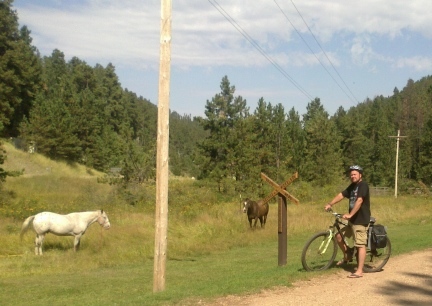 To help the riders, get your bicycles off the trail and put your bicycle facing the other way away from the horses. 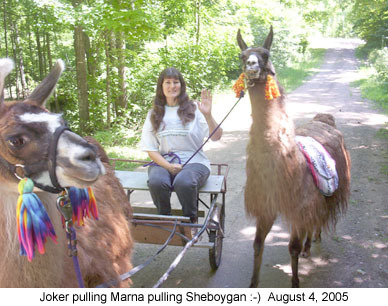 Next right away goes to any packing animals, llamas, donkeys, goats, dogs, any packing animals. This includes human packers. It does not matter if it is one person or a group. YOU WILL KNOW 'PACKERS', THEY WILL HAVE A BACKPACK ON THEIR BACKS, THIS INCLUDES ANIMALS. NO PACK, Trail Rights change. People with dogs should get off the trial for everyone. People with dogs are suppose to keep them on leashes unless it is their own property or a dog park. There are very few places where dogs are allowed freedom of movement anymore....and less all the time. Dogs are to get off the trail for all of the above trail users. So if you are traveling with a dog with you, this pertains to you. Don't Ever! Don't Ever, NEVER, touch another person's animals without asking first. Uphill Riders/Hikers have the Right Away over those traveling the opposite, or downhill. All these photos of animals....yes, they are ours. I have other websites with more on owning, training and working different species; you can see websites listed at the right of this page, sister sites. Deron and I trained a LOT of animals on the Katy Trail when we lived in Missouri. CYCLIST PLEASE NOTE: Bicycles, are ONLY above people with dogs, Bicycle must yield to all other Trail Users. Stop your bicycles for Equine and Packers. Otherwise, on a Trail as wide as (most) The Rails To Trails are, for the most part, just stay to the passing side and let others know you are there. Let people know when you are coming up behind them and going to pass. 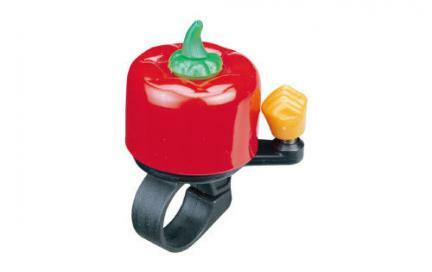 Use a Friendly Voice (and voice only when Equine are involved), and or a Bicycle Bell or horn for passing Hikers and or other Cyclers. It is also nice to speak to folks, kindly, as you pass them on the trail. I have paraphrased. These are posted at the Trail, found on the back of the Map, in the Book about the Trail....and I am sure Many Other Places. ~~Buy A Pass For Trail Use. ALL People 12 and Older, NEED to BUY a Trail Pass. ~~No Motor Vehicles except in Winter and then only in designated areas. Some Land Owners have rights to drive on the trail for access. 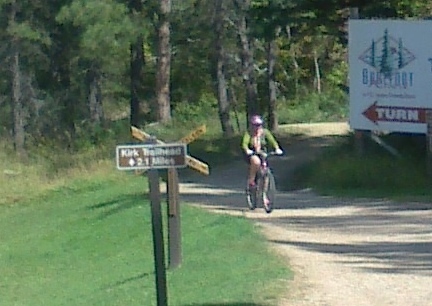 ~~There ARE Bicycle/Hiker Traffic Signs. Use Them. ~~Keep Right except when passing. ~~Cattle may be on the Trail in "open range" areas. Don't Spook or Scare them. ~~Leave Wildlife (all animals) and plants alone. ~~No Camping or Open Fires along trailway. ~~No Fireworks including Gun Shots. ~~Stay On The Trail and Respect Other People Using the same. ~~Trail Use ~ Dawn to Dusk. If it is dark out, Trail Closed. Seriously. It is not only a Trail Rule. It is not only Common Curtsy. The Small Fees you pay for use of the Trail go to Maintain it. And what I find AMAZING the people that do not pay the Fees, are the first ones to complain about how the trial is maintained. 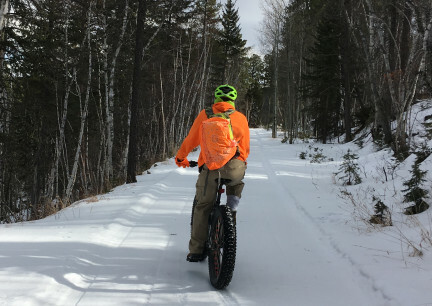 As I have said, there are Trail Patrol People out on the Mickelson Trail, few and far between, however...YOU might be looking for one out there! NEVER ~ EVER COUNT ON OTHER PEOPLE TO HELP YOU WITH A FLAT TIRE OR IF YOU NEED TOOLS FOR YOUR BICYCLES! That said, the Trail Patrol People DO carry Tubes and Tools. They have come to the aid of many on the Mickelson Trail. ~~~These Bicycle Blogs may or may not be in the order of the dates we rode them (notice I have lost 70 Pounds along the trail and credit my bicycle and eating right, working out each day). 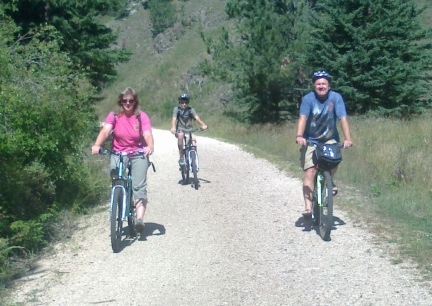 I tried to set this up with Trail Heads on the Trail from Edgemont to Deadwood. I tried to include a little bit about each trail area. ~~~Always be aware that rain drainage can change the trail and put large and small ditches in it. Also we aware that "they" might be working on the trail as you ride and you will have to go around them....as you do, Thank Them For Their Work. ~~~Think about this. When you are driving in your vehicle and come across people riding bicycles, who do you see first? The guy in the gray/black clothing or the people in the bright colored shirts? Who do you think is safer? 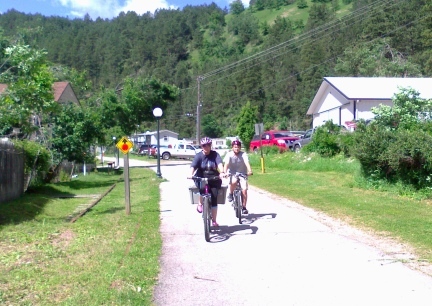 A few of the Trail Heads require you to ride your bicycle through town. And the Mickelson crosses roadways and driveways along the Trail. Be Seen. Wear Clothes Drivers Can Spot Easily! ~~~IF you wear running shoes, when riding a bicycle, you have to squish the shoe first, with each push of the pedal, before you push the pedal. You will be working harder in "tennis" type shoes than in shoes that have a flat and or hard sole. ~~Riding on a Rails To Trails Trail is a GREAT way to see a lot of a State you live in or are visiting, from a safe area, slowly without worrying about vehicle traffic (unless crossing the road or riding to the Trail) and be able to get out in the Fresh Air, Sunshine, and get Exercise, all without even thinking about it...you will be thinking about the Trail and what you are seeing and enjoying it! And the COST for all of this is so MINIMAL! 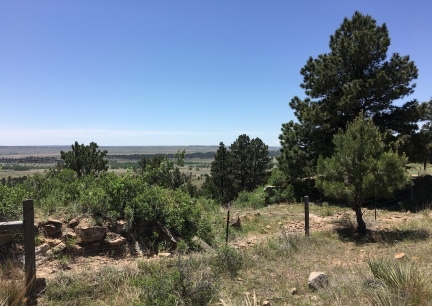 And now, because there are some people that think others are responsible for them, that think because "others did not tell them"...<rolls eyes>, THE MICKELSON TRAIL IS A GREAT AND FUN PLACE TO ENJOY! DO EVERYTHING YOU CAN, RESEARCH BEFORE RIDING, TO MAKE YOUR OWN RIDE/HIKE SAFE. WE HAVE GIVEN IDEAS AND SUGGESTIONS HERE ON THIS WEBSITE, BUT ARE NOT RESPONSIBLE FOR YOUR TRIP. YOU ALONE ARE RESPONSIBLE FOR YOUR SELF AND YOUR FAMILY AND FRIENDS WHILE OUT RIDING YOUR OWN BICYCLES. 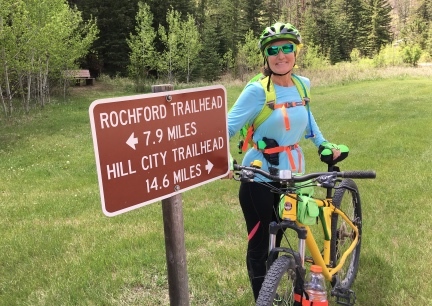 YOU ARE RESPONSIBLE FOR YOUR OWN PROPERTY, IN YOUR VEHICLE AT TRAIL HEADS AND THE BICYCLE YOU ARE RIDING...AND YOUR OWN RIDING, HIKING, LIVING, ABILITIES, OR LACK OF, AS YOU RIDE THIS GREAT ADVENTURE. 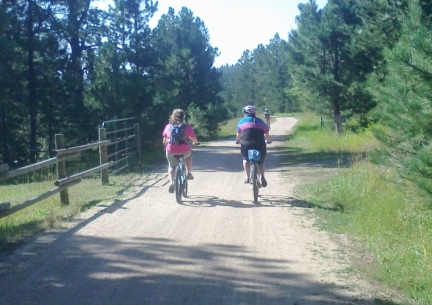 The first part of the Trail that Deron and I rode was the Deadwood end. Check out the Map, that is the hardest area as far as uphill incline in a short distance. BUT! 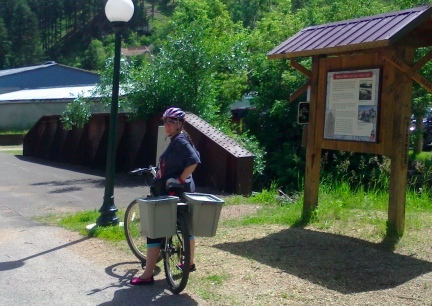 The Trailheads are closer and there are BUFFETS in Deadwood to enjoy when you finish riding the Trail.....or as I called it then, after "Suffering The Trail". I not only had not ridden bicycle much in over 14 years, but I had gained weight, a lot of weight. I was also riding a heavier Walmart Bicycle that needed to be greased in the wheel sockets/barrings. Later Note~~ Deron and I play on the Trail in this are often. This is the closest part of the Trail to where we live. 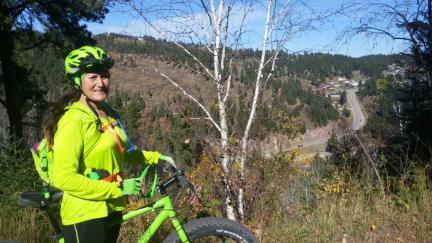 We ride it on our Bicycles, and also Snowshoe and CC Ski in this steep inclined area. Deron and I are enjoying/have enjoyed riding the entire Mickelson Trail. While we may never ride it End To End, that is, rode in one long ride, sleeping between sections, but riding the trail in several days time. We are/have riding it in sections, all sections many times over. We thought we would share our experiences. Deron and I did another section of the Mickelson Trail yesterday from Edgemont to Minnekahta and back. What an adventure! My odometer read 33.528 when we got back to our vehicle. The Edgemont Trail Head is a nice looking park. Small, call it tiny town, but friendly folks with a couple of Cafes, Pancakes for Breakfast in town for $5 on Saturday Mornings, and a few other stores and shops. There is also a Musuem right next to the Park/Trailhead. The weather was nice, sunny on the trail, and out there, not like in the Mountains, not as cool, or shady. But worked out well. We wanted to ride this section BEFORE the Summer Heat. We drove to the other end and rode Edgemont to Minnekahta. It is 16.2 miles one direction ride and riding it the way we did, we rode UP HILL first. Before we even got there, on the way, we saw Elk, a herd of (fenced) Buffalo. We saw many Cotton Tail Rabbits on the trail as well as Many Cattle, a big Yellow Cat, and a full field full of Prairie Dogs that "barked" at us as we rode by them. 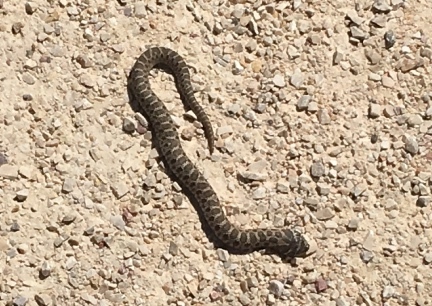 This Bull Snake, I first thought was a Rattler, as my bike went between it, kinda steering over it, one wheel on one side of it, the other wheel on the other side of it (best way to get bit, ey? ).....the snake was on the trail. I only had trouble with the hill up because the day before, Sunday, we fenced all day. I carry a good sized backpack, that is not light, it is loaded, to the top, with supplies and filled water bottles in it. So my back was not happy to carry my Camelbak with EXTRA water, and other extras, in it uphill 16.2 miles, on a bicycle. <grins> I also had a side cramp.....but after eating at the 1/2 way point and riding DOWN Hill back.....what a lovely ride! That area is so lovely, and can only be seen on the trail. Parts of it reminded me of the Katy Trail, including the type of chat they used on it in a few areas there. Lots of animals again, domestic and wild. Lots to see and smell. Not as many bridges, but one was very large and KOOOOOL and long, and very HIGH in the air. But the scenery from there, a wonder! 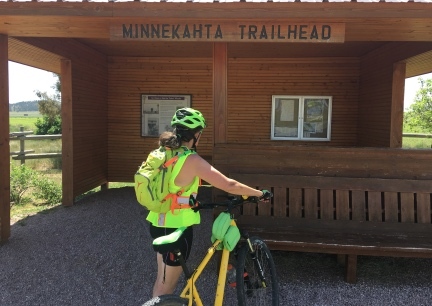 When we stopped in Minnekahta, after we finished lunch, a rider came in - he is the Trail Patrol. What a nice guy! We sat and talked to him for a short time then we were off..... and I thought, I wished I would have taken his photo for my blog.... so we rode back and asked if we could. 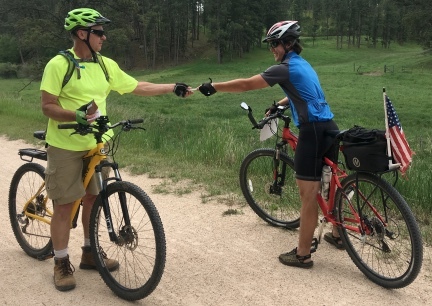 If you are out on the Trail and a Patrolperson asks for your Trail Pass, remember, THAT Trail Pass helps keep the trail system taken care of, construction, up keep and such. We asked the Patrolman to take our photo....WAY!, better than the selfies we usually take. They were doing some construction on the trail and rock was really piled high. You had to ride to the side of it and I almost lost it twice, there and back, in that swoshy area. I AM NOW, AS OF TODAY, ONE POUND UP (or is that out from?) FROM MY TOTAL WEIGHT LOSS GOAL! <big grin!> And. Man. We are a whole lot healthier! Deron and I rode the Mickelson Trail from Hill City to Custard and back. On the way back, it was 42 degrees here, and on a Mt., with WIND....we we riding right into it at an average of 17 MPH! How much cold (wind chill) IS that!!!? Yes. 22.045 miles. I think it was just a little over 1000' incline! (but only in 8 miles, not like the Deadwood end where it is that in 5 miles!) But, Yes, we worked it. <sighs> So worth it! 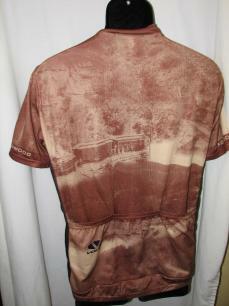 After we got back we went into the Bicycle Shop in Hill City SD and bought each of us a Mickelson Trail T-shirt. The Gal that owns the store said that what we rode was/is one of the hardest sections of the trail....FUN! We have not ridden this far in one ride since we were in MO riding the Katy Trail, on event rides and Deron was doing the Century Rides...almost 20 years ago. What a Beautiful Section of the Mickelson! Large KOOOOL Bridges, several tunnels, animals - domestic and wild, scenery and the smells, oh the pines and flowers and equine. 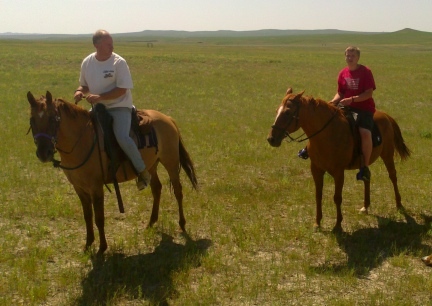 We rode through a HERD of Angus Cattle, we could have touched them if we didn't know better. 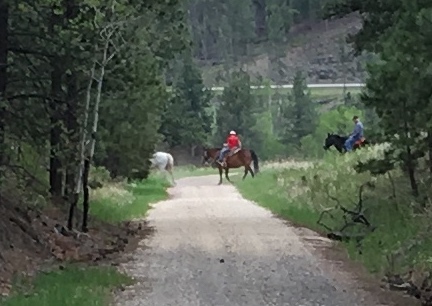 <winks> We saw a "Dude Ranch Horse Trail Riders" group. Of course we also saw others on bicycles. Really KOOOOL too, on a long (hard) ride like that, to have so much to see. It was a beautiful day too. I got cold, again, coming down the far side of the hill. Coming down, the kind of down hill that you still have to pedal. I/We did have to stop a few times to catch our breath. Even coming down the last hill, I had to stop twice to stretch my body. My back and some toes were cramping. We are already talking about another "tough" section of the Mickelson.....and looking forward to it! 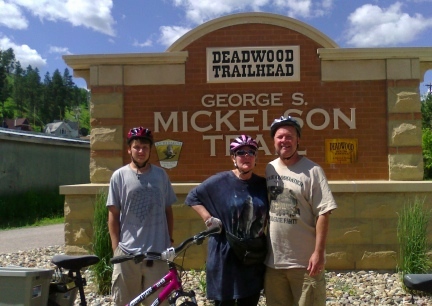 Deron and I met our good friends, April and her son Tom, at the Dumont Mickelson Trail Trail Head. WHAT A LOVELY DAY FOR A RIDE! We rode to Rochford, just over 10 miles, and then into town, adding to our mileage to, just a tad under, 11 miles. The weather was so cool; when we started, that I was debating a jacket. The sun was out, but not beating down. There was a breeze, but not so much wind that it takes your breath away and or dries you out as you pedal. The Trail was chat (small packed rock), all but a bit of larger rocks near the Really KOOOOL Tunnel....this is a Rails to Trails Trail. The company was fun. We had a good time riding, visiting, laughing and taking photos along the way. When we got to Rochford we had lunch at a.... what do you call that. More of a living room with tables than a restaurant/bar. There were musical instruments were set up and I am betting it IS the place to be, in that very small town, on a Saturday Night! "Population 25...depending on the time of year". 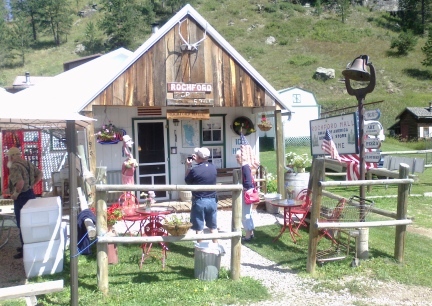 They also have, what they claim to be, The Smallest Mall in the USA....a small, used to be a house, store with groceries, t-shirts (I bought a Michelson Trail T-Shirt) and other souvenirs. They also serve Ice Cream....no I did not that time, but we are planning more rides there. <smiles>. April's husband, Tom, picked us up in Rochford, we had lunch together and visited some more. IT WAS WONDERFUL! I am also excited that I rode the 11 miles without problems. I am so glad to have my endurance up! 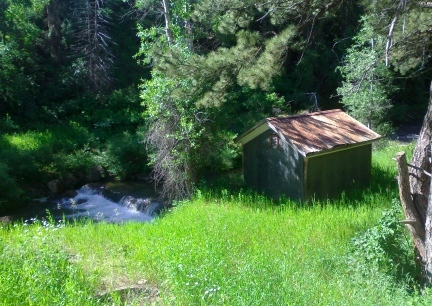 I can not wait to get back out on the trail and see more of the SD area we have not seen. I am really thankful to have had all the short rides so that I COULD build up and not hold people up on the Trails. My health is better, since we have been out riding again, and MAN! I am loving be back out on a bicycle again! If you are looking for a nice and easy ride, this is it! 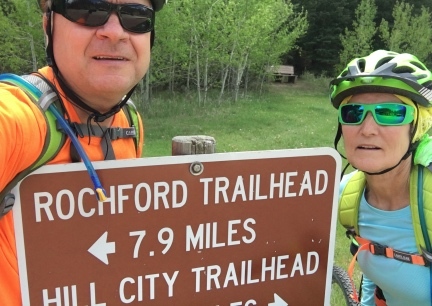 Lots to see, nice easy trail, down hill but with pedaling, and good food at the other end. These photos were taken on 2017-10-10....that's right OCTOBER 10TH! There was both snow and ice in patches from Rochford to Dumont. For the Mickelson Trail, no matter what the calendar says, you need to carry something for your ears, and a jacket. 23 Miles, round trip, and HILLS! The Trailhead in Sugarloaf is a killer hill! But so worth it! And on the way back...you could tell you were going Down Hill. But. 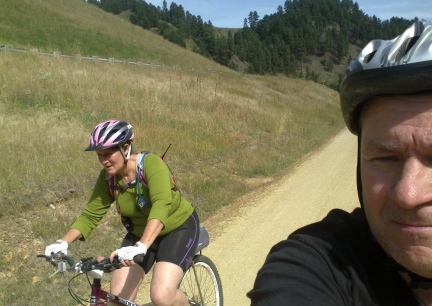 As with each area of the Mickelson Trail downhills, you do have to pedal. ~~We have since started riding this area often. It is lovely and such a great Work Out. When you leave Sugarloaf there is a VERY steep corner going out. 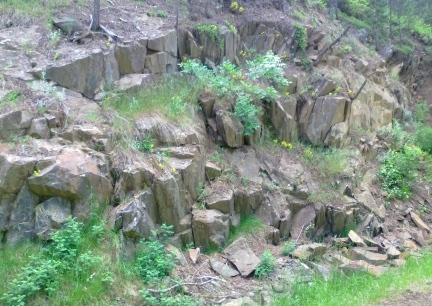 You will climb an incline almost all the way to about 1 1/2 miles that side of Dumount. 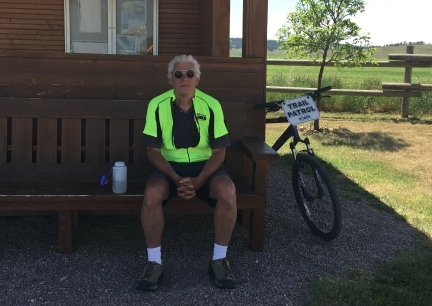 Plan to have a rest and snack at the Dumont Trail Head. 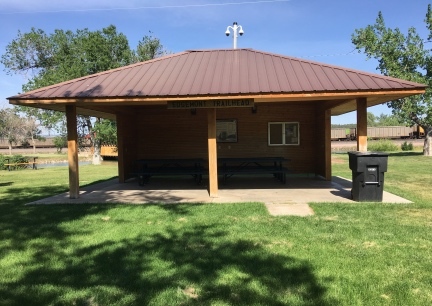 Dumont does have a Pit Toilet, Shelter with Fire Pit (rest stop for Snowmobiles in the Winter), Benches, Picnic Tables (inside), and a very large Parking Lot, as well as a Bicycle Stand and Fee Pay Podium. 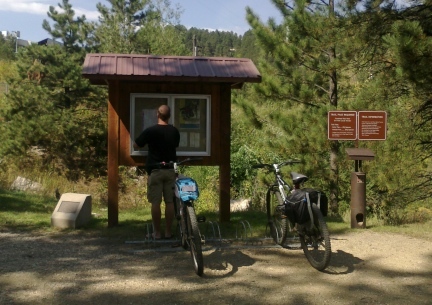 If you are only riding to Englewood, the Trailhead does have a Pit Toilet and Water with a Bench, Leantu and Picnic Table. If you ride around the back through the Parking Lot, you can see the remains of an old Stage Stop Building. The ride back to Sugarloaf is a very easy one. It can go pretty quick. Watch for 'puddles of loose small gravel' where the trail has been repaired. I struggled the first half. REALLY struggled, but slowly and taking many breaks, I made it to Kirk. After a short sit down break, the ride back was fast and fun. The book says that it is 3.5 miles between the two. Blake's Odometer said we rode 7.525 miles. 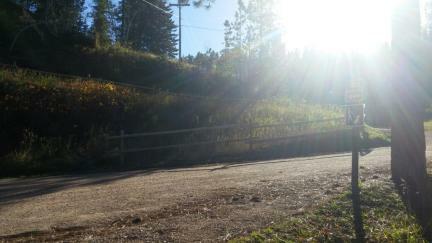 ~~~~Note: Deron and I ride our Bicycles, Snowshoe and CC Ski on this area of the Trail often. 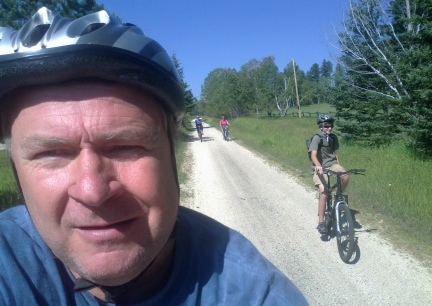 When I first starting riding the Mickelson, I was very out of shape and fat...since then, riding Deadwood to Kirk is easier, faster BUT!, it is a steep incline and will wear down even the seasoned Sports Person. Yesterday Deron and I rode the Mickelson Trail. The plan was to go further than we did, but the uphill was KILLING me. So much so, I have to admit, I had to walk the bike about 1/4 to 1/2 (not all at once, just a little bit once in a while). When I say uphill, I had no idea how much of an uphill til we turned around and went back. I barely pedaled. In fact I used the brakes far more than the pedals. Deron was certainly flying at over 20 MPH on the way back, I was not too far behind him. A VERY GOOD 12 MILE RIDE! Hard work out. 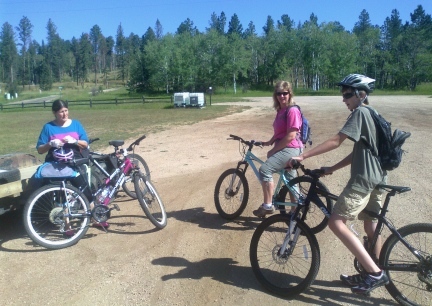 (my foot is feeling it all too <sighs>) We rode Deadwood to Sugarloaf and back. This past week, with 3 days of mud here (could not ride) we rode just over 31 miles, not bad. 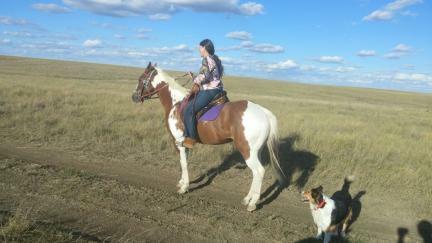 We rode the prairie today, 5.525, that will start a new weekly tally. My health is so much better since we started riding bicycles again! 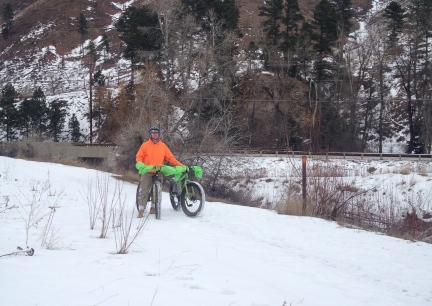 We even went and test rode FATTIES! (those big framed, big tired bicycles for snow and sand and any other surface). I just don't know if my lungs can handle the cold with riding in the high winds here in the winter. Deron and I have been riding our bikes almost every single day. It is such a good and fun work out for both of us. Deron and I got up early and headed out to Custard, SD to ride the Mickelson from the Trailhead in Custard to the Trailhead The Mountain. What a ride it was. 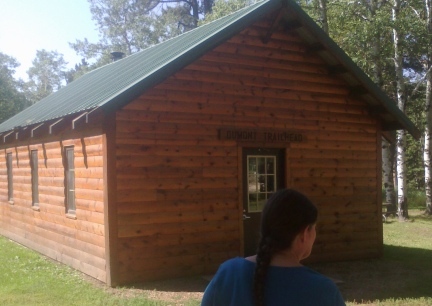 The Trailhead at Custard is especially nice, however, the bathroom is a couple blocks away from the Trailhead, and not especially nice. 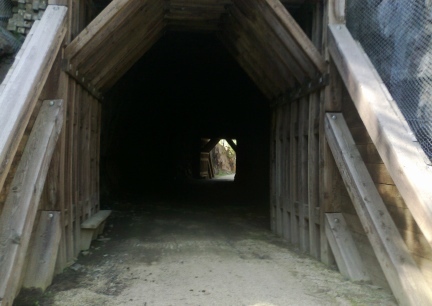 If you enjoy Trains, this would be a fun Trailhead for you to see. They have a real Caboose as well as RR Signs set up right along the Mickelson Trail. You really don't even have to get off the trail to get see it very close up. Along this steep incline we were happy to see Jacob, who gave us permission to post his photo and put it into the book I am writing about the Mickelson Trail. ...We were told that the Custard to The Mountain was a rough area, with a lot of wash out. There had been a LOT of rain for weeks before we rode it. LOTS of days of rain. The Trail was easy to ride with no problems at all the day we rode. Deron and I did not realize how steep this incline was going up, but coming back down....a breeze. In fact we used our brakes quite a bit. 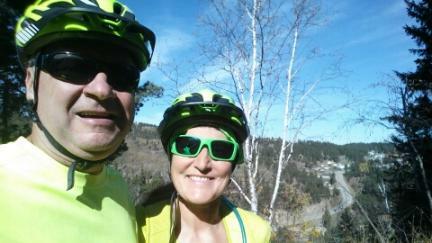 We did play in Custard and in fact stopped in Hill City a bit too, after our 10.87 mile ride. 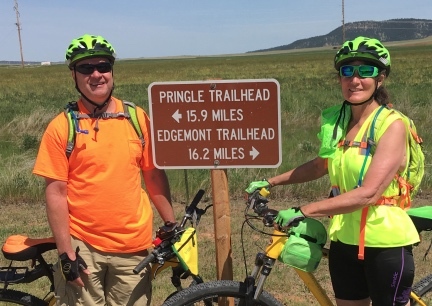 I must say.....I was NOT impressed with Pringle's Trailhead. Not even a little. I understand Pit Toilets, hard to clean and keep fresh, and even harder when the toilets are so far from town, but the toilets in Pringle were RIGHT in town. That is in fact, Right off Main Street, and they were not clean. Pringle also has their two town usage huge Trash Bins right in the Trailhead Parking Lot of the Trailhead...and they stank! Pringle did have a very small Pavilion, with a picnic table and bench. But I sure would not eat there with all those smells going on. The Bicycle Gate Sculpture area has become a Bicycle Junk Yard. And that is a shame since the idea and beginning were so attractive. It is a shame because someone did a great and wonderful job making the Huge Bicycle for the Bicycle Fence Gate! A LOT of thought and work went into that. We decided NOT to stay and eat in Pringle with everything being such a stinking mess.....and the Shop/Restaurant Owners might want to think about that....we saw others that felt the same way, a large group from TX, I think there were 25 bicycle riders in that party, moved on right before we did that day. This part of the trail, and day's weather, was a long, cold, uphill ride going out! Yes, cold on June 18th. 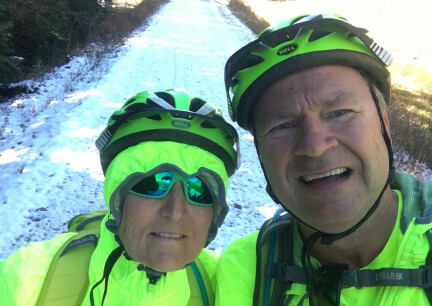 I had worn long bicycle pants and a long sleeved T-shirt with a sweatshirt over that, as well as a Fleece Headband under my helmet....and I was still cold. Which just goes to prove the above writing....be prepared for weather, any weather while out on these trails. It is a pretty steep climb up to Custard, but so worth the ride. When we got up to Custard we split a Hotdog and Gatorade to refuel and warm up a bit. We both needed it. We used the Restrooms inside a Gas Station in Custard, and they were very clean and fresh. The ride back down to Pringle was pretty fast, the grade is such that anyone could ride it (down that is). We used our brakes quite a bit. By the time we finished our 25.74 mile ride we were HUNGRY! and a bit Worn Out...but man, what a ride! Felt so good, felt so accomplished. After the ride we went to Hill City to a Brew Pub called, Sick and Twisted. They had live music and people watching there was quite fun. And this completes our entire South to North Trip on the Mickelson Trail! What a Ride! The weather was chilly and windy! I wore a long sleeved T-Shirt and long Bicycle Pants...and I did not change out into the clothes that I was carrying. Riding from Minnakata up to Pringle was not easy....but we did it. We did stop many times along the trail for me to catch my breath. The last two Thursdays Deron and I have gone to Hill City. It is about 2 1/2 hours from us so Deron works in the front seat. 9/21 we went to Hill City but only rode just over 7 miles on Mickelson....quite the climb out of town. Then we rode back to town, grabbed lunch and rode the 1800's Steam Train....kinda for Deron's birthday. OH IT WAS FUN. We also went to the Train Museum. 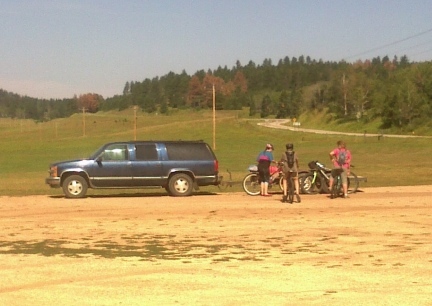 9/28 We went back to Hill City and rode the Mickelson to The Mountain. Round trip, just over 22 miles. 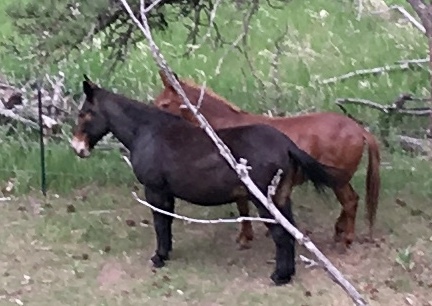 There is a horse in a pen, just out of Hill City, that is just chest high for the horse, just thin 'log' type fencing.....the horse?, MEAN. It came running up when we were riding our bicycles, so of course I stopped. Man. He acted all nice, I went to pet it and it threw those ears back and wanted to BITE! (we laughed) and rode on. On the way back, I wanted to get a photo of the horse to post to warn folks..... Son Of A ........ IT'S A STALLION! Who does that!? Who puts a Stallion behind a fence like that?! And! IT IS RIGHT UP TO THE MICKELSON TRAIL, not 4' between them. Any one else smell trouble?????? After we ate at a Place called Bumping Buffalo....Deron Loved it. 1/2 pound of burger WITH a lot of SMOKED BRISKET. Yeah, I had a bite. Hard to get my mouth around. Me? Salad. Always the salad. We took a ride after to look at the Fall Colors. I must admit, I miss MO and WI when it comes to that. It's just not as colorful here. OH SUCH A FUN DAY! And. I bought that Blue Mickelson Trail shirt. I really like it. (I might have a pink on like it too. <laughs>) You know what they say.....If you find a piece of clothing you like, wear it, wash it, then go buy other colors in the same. This is NOT the only Shirt I own that has Mickelson Trail on it.... I will have to get photos of my others. It is just fun to own and wear Rails To Trails shirts. When you have ridden much of the Trail you feel a bit of "ownership" in the adventure of it all. I used to own a Katy Trail T-Shirt...not sure if I still do or not. 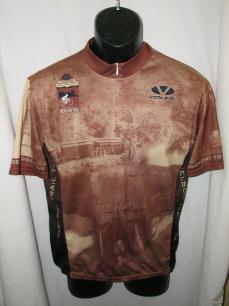 I wore it when I rode the Katy Trail End to End in 5 days with a Church Group... We spent a lot of time and put in a lot of other miles on that Katy Trail too. LOVE IT! The plan to ride the 5 miles (The Trail Map says, 4.8 but we ride around the parking lot til the odometer says, yeah, your good, even number) to Englewood, take a short break, and ride back. How HARD could it be???? It is JUST 10 miles. Harder than I thought it might be! And Half way to Englewood is on a pretty steep incline.....in some areas HILL! Some hills on the way back, not near as bad. 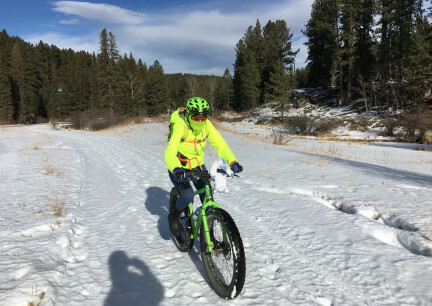 It also turns out that riding on snow, any snow, IS GRUELING! (at least for me!) And since you ride in those low (easy <read, crank, crank, crank, fast and hard ~ I call this dink dink dink!> gears) You are moving your feet at about each and every minute! (she says huffing and puffing in memory) I HATE DINK DINK DINK! The wind kept 'picking up', and I was soaked under my layers that I needed to keep on so that the wind and air would not freeze me. Would I go again? That is ride that 10 miles on snow again??? 5 miles, yes. 6 miles, yes. 10 miles? <sighs> Maybe. But it sure won't be tomorrow and I might pack a LUNCH rather than just a snack this time. AND! I would switch bikes with Deron. 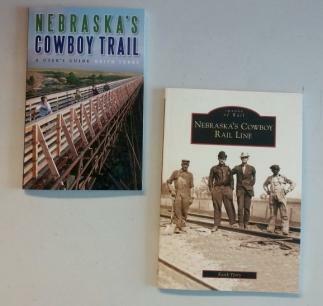 We are talking about riding, if not all, sections of the Cowboy Trail in Nebraska. I will be writing a Blog here on this site about the Cowboy AFTER we start riding it. From what I have read in the book, and in a Letter from their Parks Dept VS What ACTUAL PEOPLE WHO HAVE RIDDEN ARE SAYING on online forums...Shall See. I will print the truth of how we found the trail to be and the dates that we rode it. The contents of this page for Mickelson Trail by Bicycle is still under construction. Please check back later.